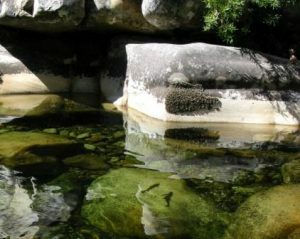 The recording of rivers and sections of rivers is, perhaps, the prime object of the Exploration Group. This is based on the viewpoint that no river has been fully explored until a report on it has been published. The fact that any given water may be well known to a few individual anglers is of little or no practical value to the rest of the members of the Society. 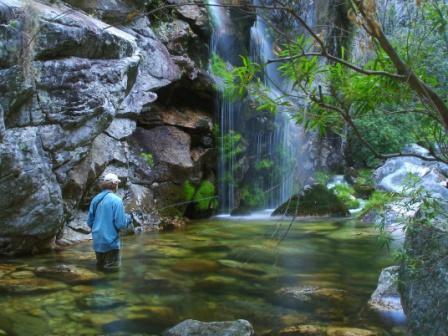 Sixty one years ago, the Cape Piscatorial Society held a meeting to formally establish an Exploration Group which would, for the benefit of members, explore, map and describe the streams which they fished. This applied, in particular, to the more inaccessible upper reaches of canyon streams like the Witels and the Jan du Toits. 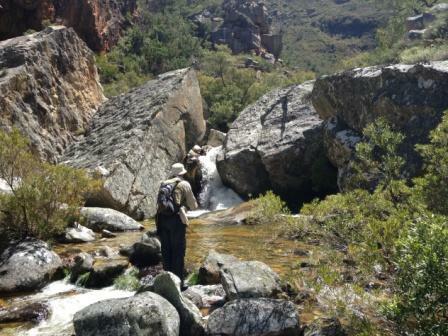 The Witels, in particular, posed challenges because there were narrow sections with sheer cliff faces on either side. The only way to fish beyond these sections was to carry inflatable air mattresses and to use them as a form of water craft to ferry one’s camping equipment, cameras and fishing tackle through these otherwise impossible barriers. This was long before the era of ultralight camping equipment and freeze-dried foods so the planning had to be precise to ensure both survival and fishing enjoyment without fatigue. 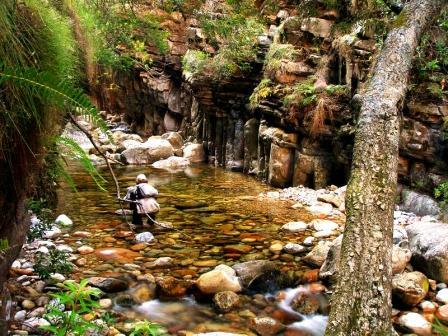 The accounts of these trips were compiled in a book, Trout in the Kloofs, now rare and much sought-after. A few years ago, Tom Sutcliffe took American photographer Denver Bryan to the Jan du Toits. For decades Denver’s photographs have featured as the front covers of leading fly fishing magazines, yet he described the JDTs as the most beautiful stream he had ever photographed. I am indebted to Sunet van Antwerpen of Virtual 24/7 who continues to assist me in making the best articles published in Piscator since 1947 available to an internet audience.